It’s often said that “What gets measured gets managed.” It follows that what’s easiest to measure is most likely to get attention. For media companies, that usually means their top two Key Performance Indicators (KPIs) relate to advertising revenue: Pacing against Last Year and Pacing against Budget. But do these metrics actually move the needle? Simple pacing stats are fine for benchmarking sales performance, but they don’t surface opportunities to improve account management or operational processes. Some media companies have tried to use the ‘Big Data’ in their traffic systems to create new KPIs. Finance, Sales and IT teams learn quickly that it’s hard to do — spreadsheets just aren’t robust enough to support ‘homebrew’ BI solutions. Even devoted “data teams” of Excel jocks struggle to generate insights that managers can easily understand and use. This is where Business Intelligence (BI) software can help. 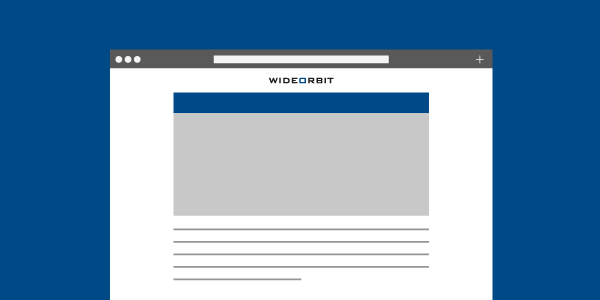 BI packages like WideOrbit’s WO Analytics automatically generate reports from the mountain of data collected by traffic systems with pre-defined metrics or company-specific KPIs. Are pre-empts, make-goods and ad credits helping or hurting profits? Staying on top of these everyday expenses can provide additional lift from closed revenue. One media company told us it grew its ad revenue by 5% simply by optimizing pre-empts. What price discounting structures do advertisers receive? In the heat of closing a sale, it’s easy to lose sight of what the advertiser actually agreed to pay for your valuable inventory. By taking a closer look at traffic data, WO Analytics has pinpointed discounts as high as 80% that managers never knew about. That’s an extreme case, but 20 to 30% discounts are common and should be surfaced for management review. How much customer churn are we experiencing? Study after study agrees: it’s a lot cheaper to keep a customer than sign up a new one. The first step to cultivating a healthy customer base is knowing how many of your current advertisers are loyal and whether the sales team is doing a good job of keeping them on board. This is just scratching the surface of what’s possible by applying business intelligence to data in traffic systems – ‘Big Data’ that you already own and is ready for action. By releasing the power of the data collected by traffic software, managers will have new tools to fuel sales performance and drive more value from business relationships. Get in touch with us today at sales@wideorbit.com to find out to get started with business intelligence and spotlight the right KPIs for growing your business.